Yingmei Duan is a curious observer who asks questions of all facets of life in order to continuously learn and develop. For the past twelve years she has concentrated her energy and creativity on making performance art and researching the medium. 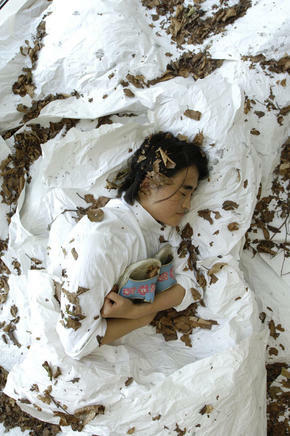 Much of Yingmei’s performance art explores human instincts such as fear and desires. Various different themes inspire Yingmei and are reflected in her work including examining society and questioning its conventions and human behaviour. Within her performances she crosses mediums and often incorporates sound, video and installation. She often spontaneously develops performances as situational experiments. On the other hand she can also plan her performances with intense attention being paid to the last detail. Besides her solo projects Yingmei loves to work with people from different cultures, ages and areas of life and has realized over 50 collaborative performances. Her artworks frequently in progress, and can stretch over long periods of time.